Syrup is only the latest in a long line of creative solutions Rutstein has employed in making his unique bar a reality. Wanting to open a restaurant in Jamaica Plain focused on small-plate comfort food, Rutstein shopped around for properties and found an affordable option in an unlikely spot – the former rectory of the Blessed Sacrament Church, which closed its doors in the mid-2000s. 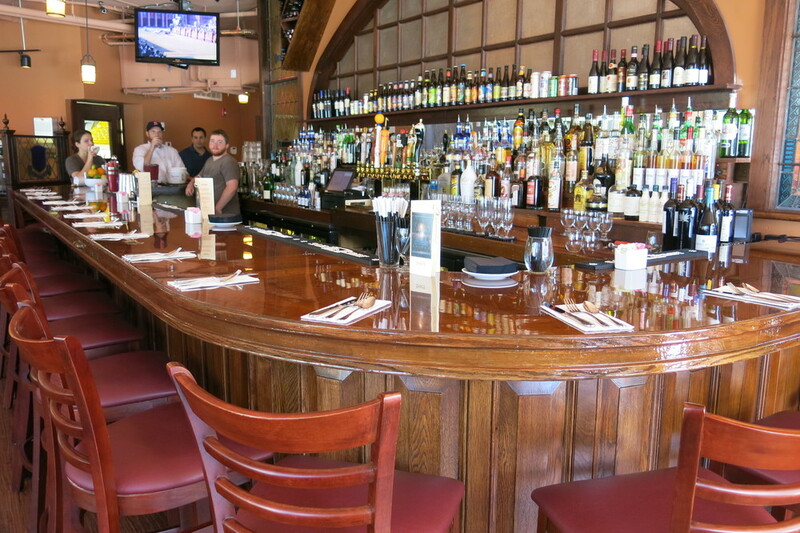 A church rectory might not be the most conventional of settings for a bar and restaurant, but a good deal is a good deal. 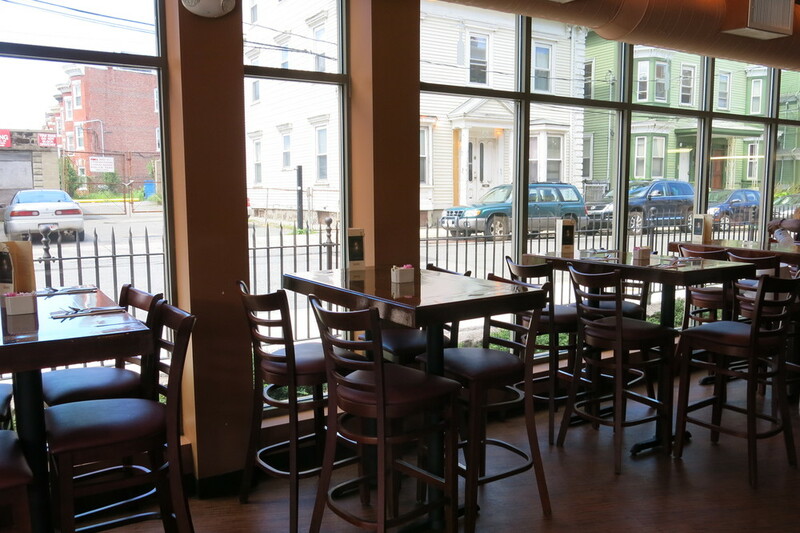 And instead of distancing his new venture from the building’s previous function, Rutstein doubled down – he decided to outfit his new bar with reclaimed wood and used furniture from area churches. So where does one look for used church fixtures? The internet, of course. And in further proof that there’s a market (and a website) for everything, Rutstein found a site called usedpews.org, which connects sellers of used church furniture with prospective buyers (keep this in mind the next time you need an altar for…whatever). Thus began a months-long crusade in which he accumulated pews, stained glass, and a host of other relics from independent sellers throughout the state. 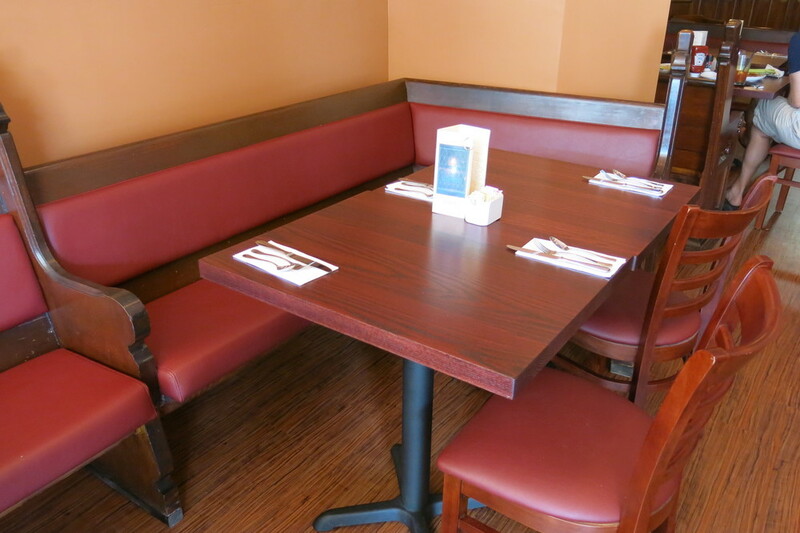 The church pews now serve as benches in the dining area. 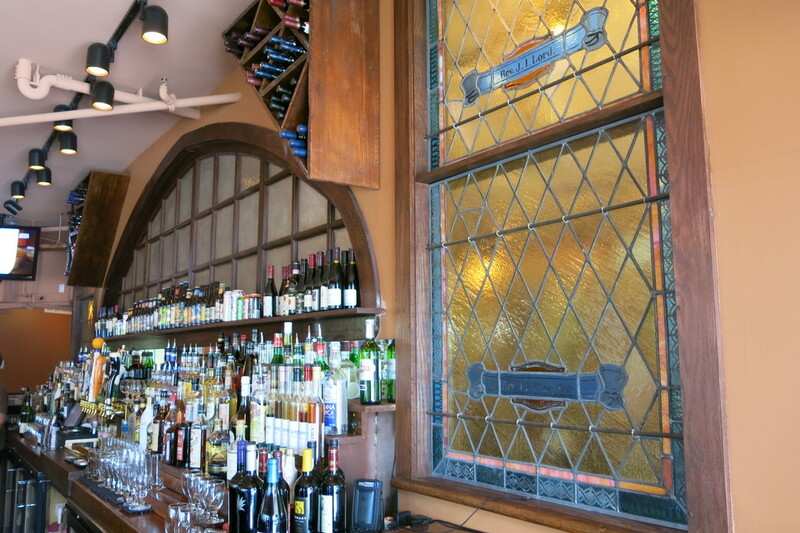 Stained glass windows from various local churches flank the bar area. 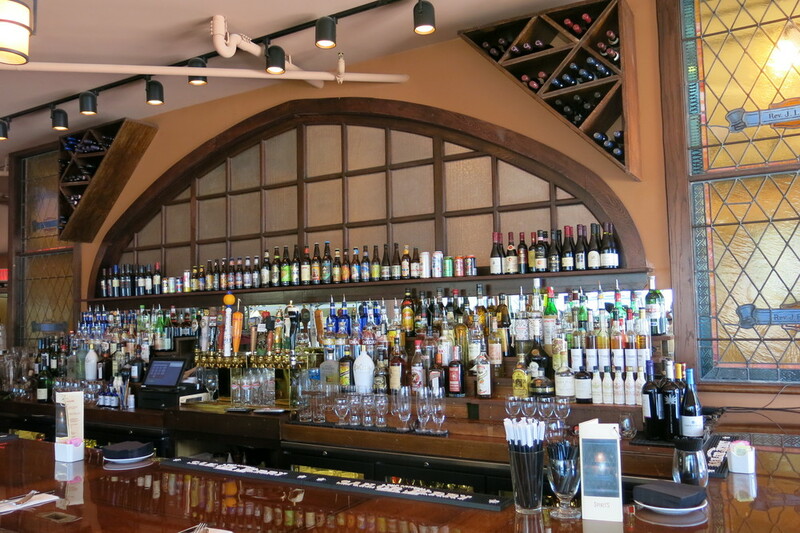 Cabinetry from a church in Charlestown was re-cut and used as shelving in and around the bar. 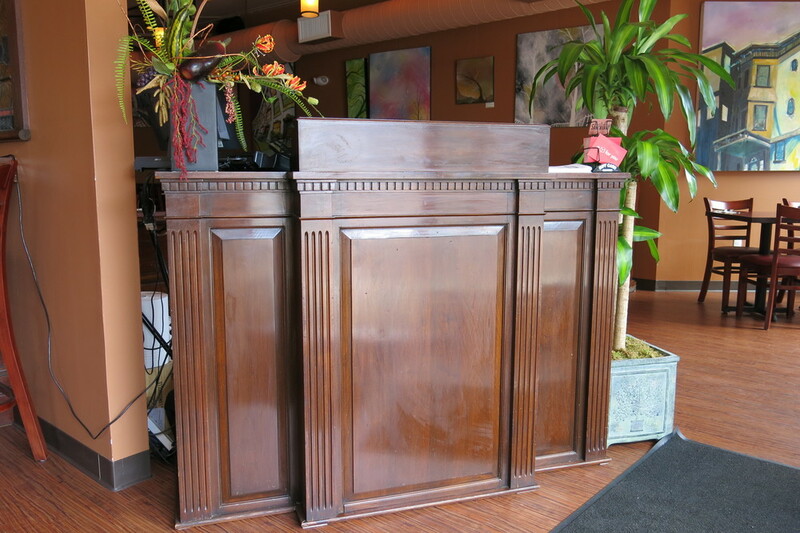 An old pulpit doubles as the hostess desk. Only one thing was missing – the bar. And since most churches don’t have bars, finding one that fit the theme wasn’t an option. But in a true case of thinking “outside the box,” Rutstein’s architect spotted a choir box on one of their pilgrimages and said “there’s the bottom of your bar.” With a bit of creative carpentry, it became exactly that. The wood from the choir box was cut into the bottom portion of the bar, complete with an angular curve that makes for a classic L-shape. 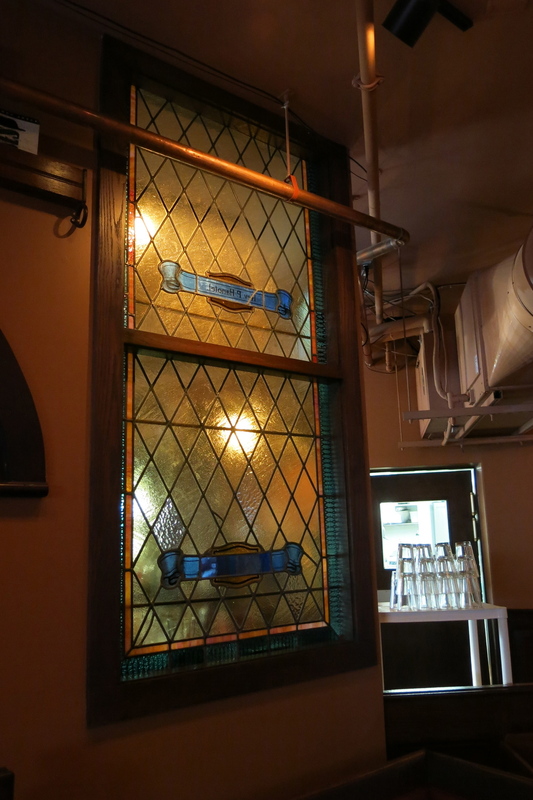 For the surface of the bar, they used a couple of 800-pound oak doors found at a lumberyard. The wood was so thick, it had to be cut with a saw normally reserved for slicing cement. Wood leftover from the doors was then used for some of the tables in the bar area. Although cobbled together from disparate parts, the resulting décor is cohesive, tied together by gleaming hardwood floors and warm, orange-brown walls. It’s an inviting atmosphere; and even though there are no confessionals, you might find yourself opening up after a few strong drinks. The night before I met with Rutstein, I visited Centre Street Sanctuary with a good-sized crew – my sister Kelly, my cousin Adam and his girlfriend Danielle, and later my other cousin John and his friend Vanessa. 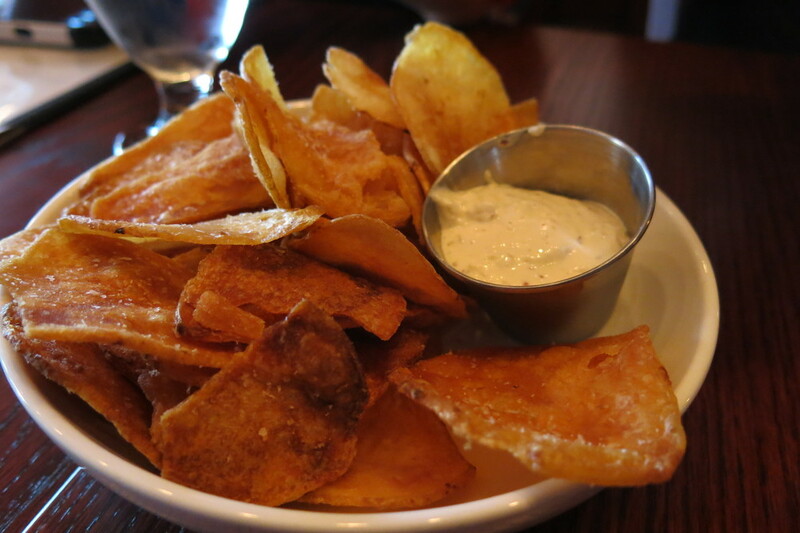 We perused the cocktail menu and enjoyed a complimentary bowl of crispy, hand-cut chips. 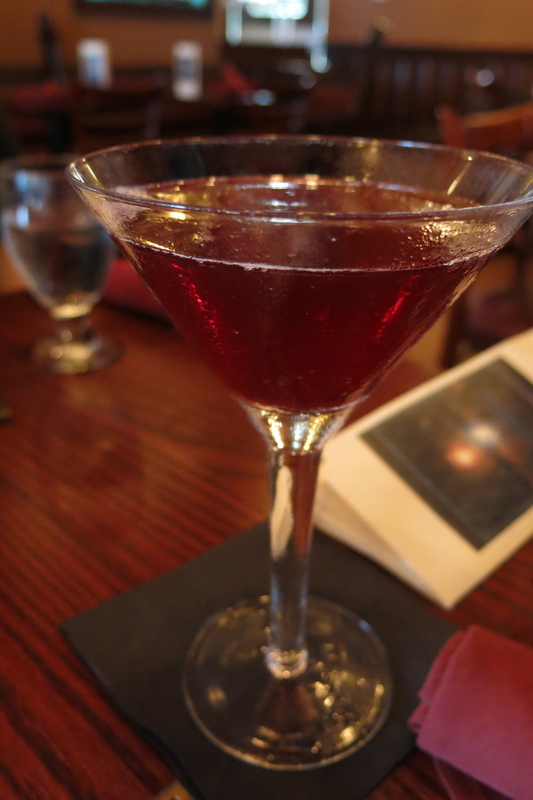 Centre Street’s drink list is divided into three sections – Sangrias, Drinks, and Martinis and Manhattans. Danielle and Kelly began with two of the sangria options. Danielle’s Nectar of Life was made with white wine, rum, jasmine liqueur, mango puree, orange juice, cranberry juice, and ginger beer. 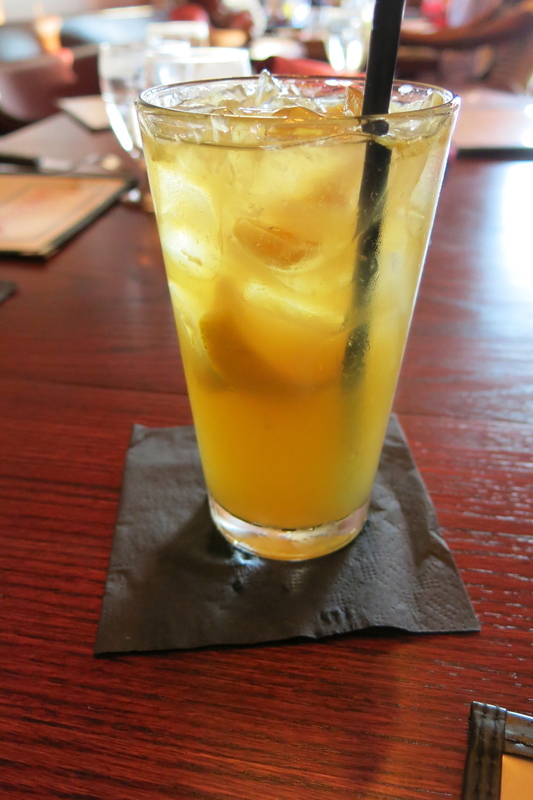 The mango puree stole the show and lent the drink a deep yellow hue. 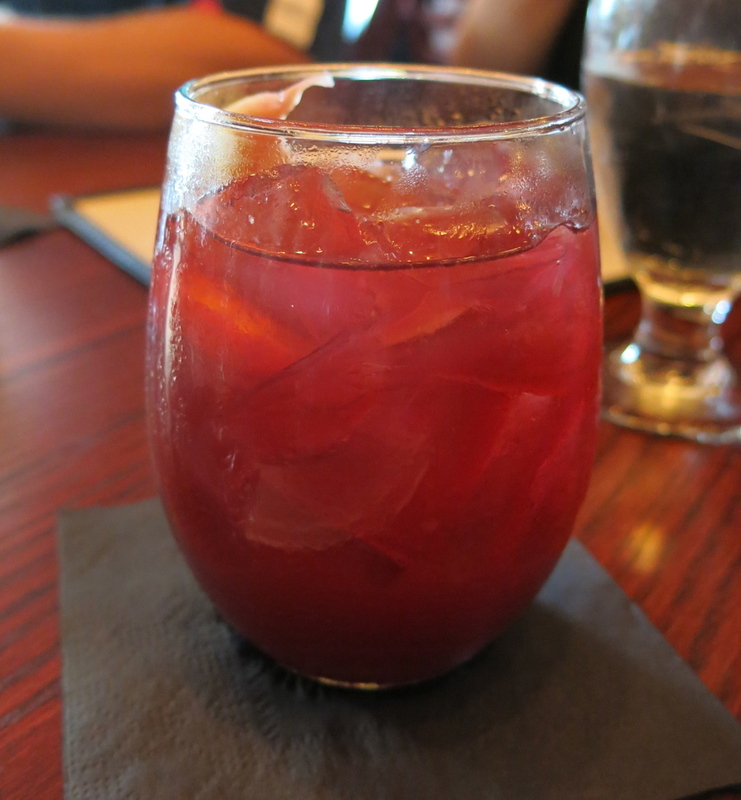 Kelly’s appropriately named “Short but Sweet” combined port wine, blood orange liqueur, and ginger beer. 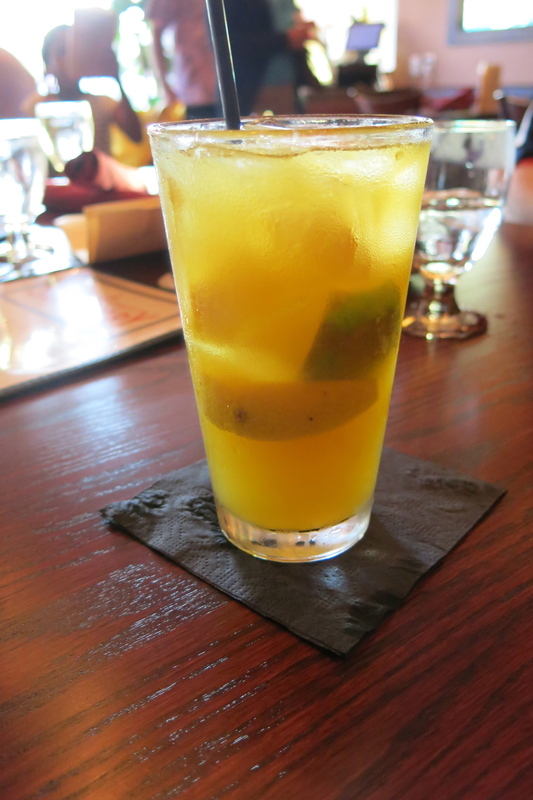 The port made it a little sweeter than your average sangria, but it was the ginger beer that gave it a truly unusual dimension. Adam opted for the Mug o’ Grog from the Drinks section – rum, fresh lemon and lime juice, St. Germaine, peach bitters, orange juice, grapefruit juice, and soda water. The citrus components seemed to elevate the already prominent rum flavor, while the St. Germaine softened the drink and lent it a floral essence. I, of course, headed right for the Martinis and Manhattans and ordered the one with the best moniker – the Drink From the Grave. 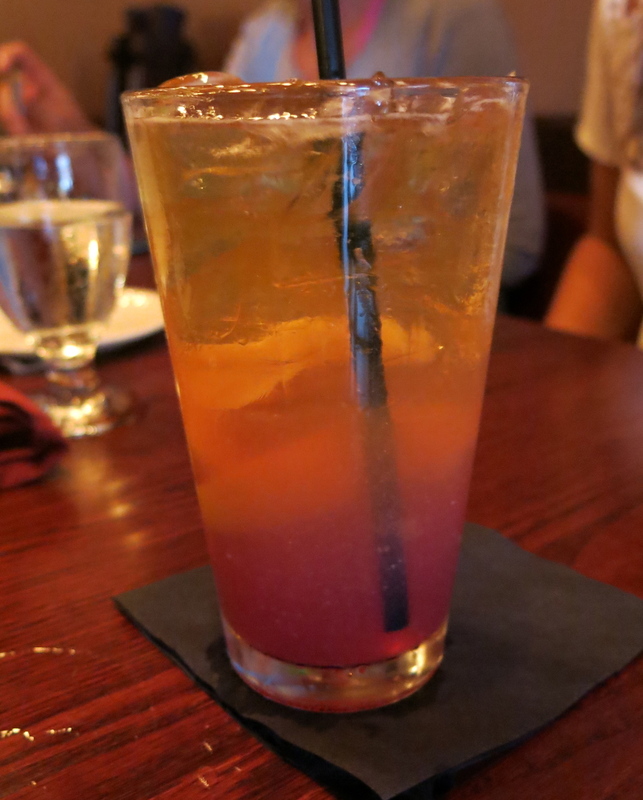 Presumably named for its blood-like hue, this lugubrious drink was made with Angelica liqueur, Maurin Quina, brandy, triple sec, lemon juice, and bitters. The flavor was deep and complex, with forward notes of cherry and cinnamon from the Maurin and Angelica, respectively. With the chips long gone and the alcohol gradually making its presence known, we needed a little food while we waited for John and Vanessa. 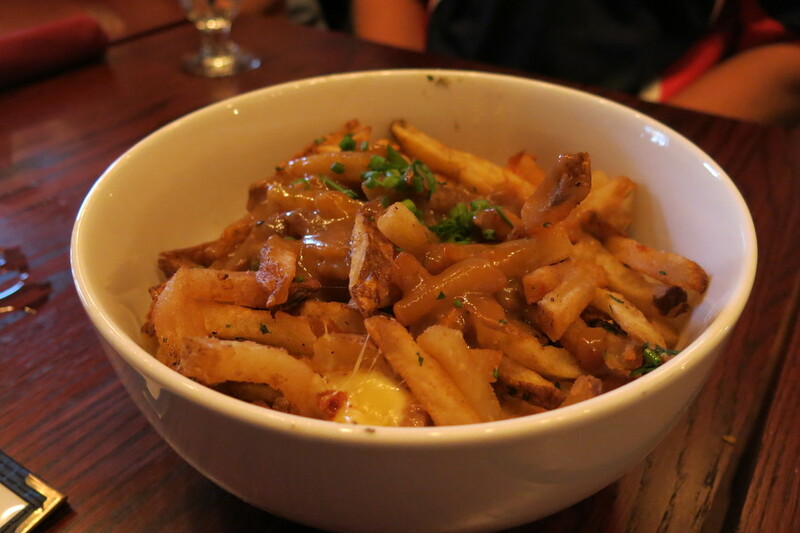 First up was the modestly named “Fries and Gravy.” I say modest because Centre Street should call this what it is – poutine. Now I don’t use that term lightly or inaccurately, especially given the many poutine imposters served throughout the Boston area. (If someone gives you “poutine” with melted cheese instead of cheese curds, you need to walk away.) But as a veteran of 15 Montreal Jazz Festivals, I feel qualified to call this version authentic. Maybe a strict poutine-ist would quibble with the bacon, but this mix of French fries, brown gravy, cheese curds, and scallions is the real deal. No need to be humble, Centre Street Sanctuary. Your poutine holds its own against the best. As we devoured the poutine (there, I said it again), we were joined by John and Vanessa. John dove in with the boldly named Drink’s Boss – a mix of amaretto, Kina L’avoin d’or, Cynar, port, cherry bitters, and cola. 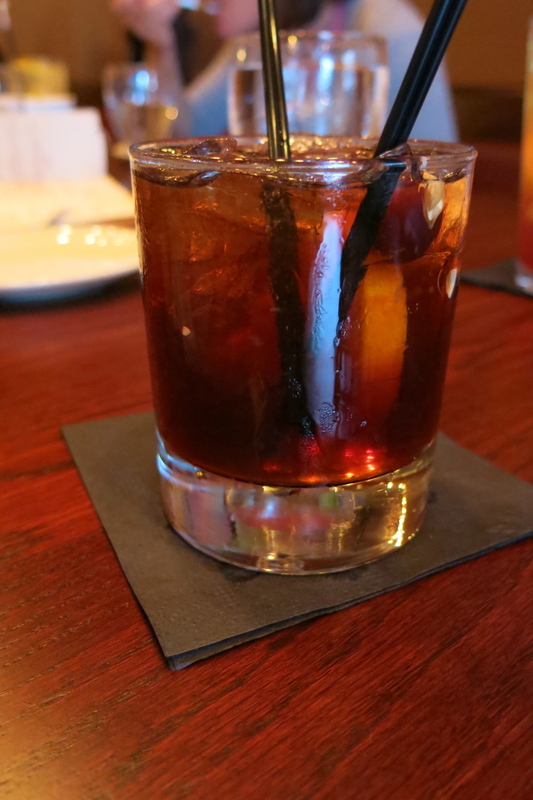 Led by a powerful punch of amaretto and cherry, it was eerily reminiscent of a Dr. Pepper. A highly potent Dr. Pepper, that is. Vanessa opted for the Hyde Square Shandy, a seasonally appropriate blend of Sam Summer, lemonade, pomegranate juice, St. Germaine, and grapefruit bitters. Perfect for a summer evening. Finally, with all of us pew-ed up, it was time for dinner. Centre Street Sanctuary’s food menu features mostly small plates, though there are also steaks and a handful of other entrées, highlighted by a tempting seafood etouffee. 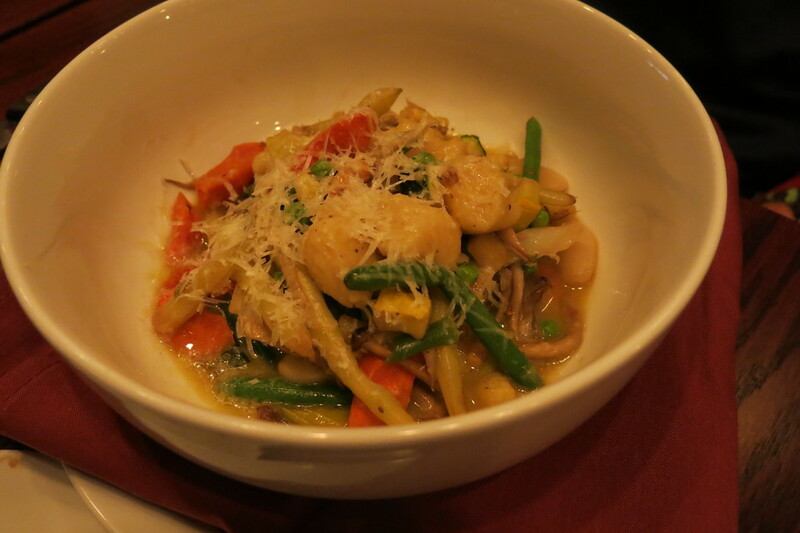 Adam and Kelly went the entrée route, with Adam opting for the delicious hand-rolled gnocchi. 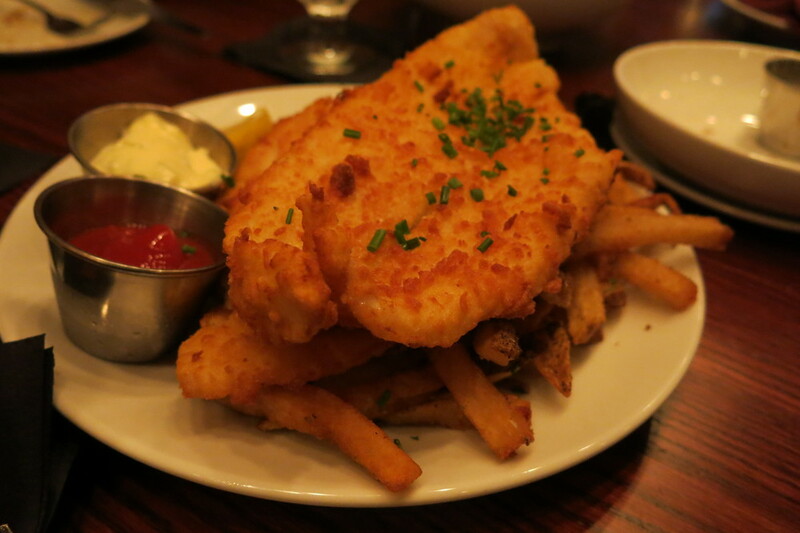 Continuing her uneasy truce with seafood, Kelly ordered the fish and chips, which she described as flaky and mild (she meant that as a compliment, though it sounds weak now that I’m writing it). The rest of us stuck to the small plates. 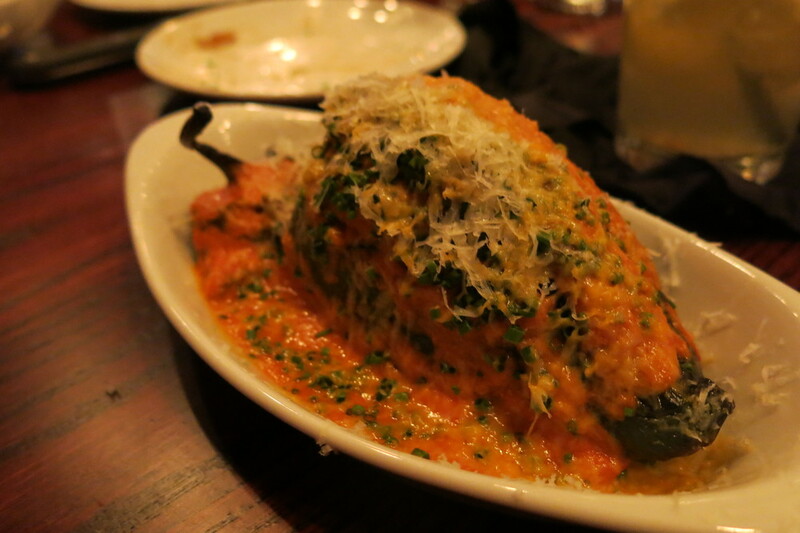 Danielle chose the rather substantial stuffed pepper, filled with quinoa, cheddar, and tomato fondue. John got three impressive looking sliders, topped with muenster cheese and house-made bacon. 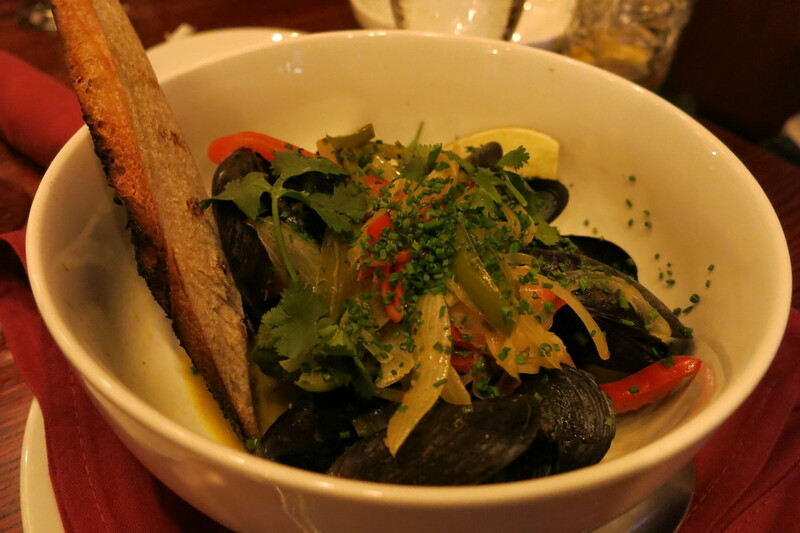 Vanessa got curried mussels, topped with peppers and onions, spiced up with cilantro and coconut milk. A slice of grilled bread on the side added a little crunch. I went with the duck spring rolls. 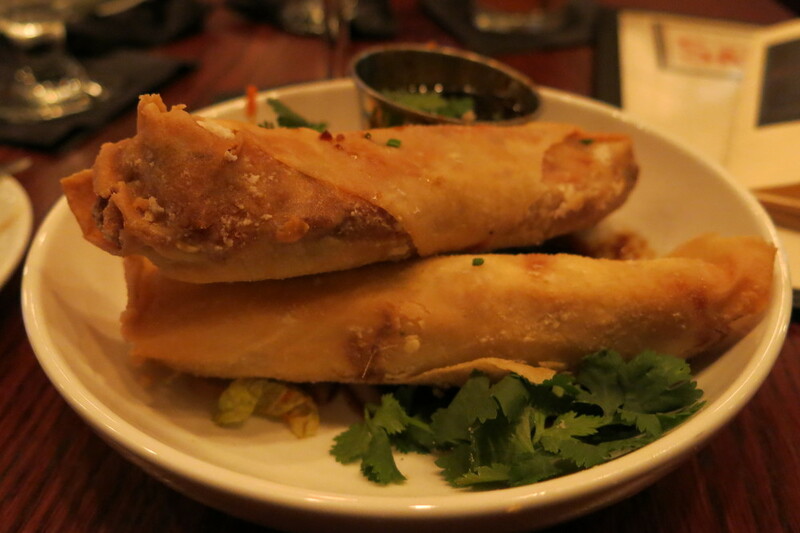 These were fantastic – crispy on the outside, filled with duck confit, cabbage, onion, and shaved carrot. A spicy Asian BBQ dipping sauce put it over the top. We wrapped up dinner and ordered another round of drinks. Like Vanessa, Kelly got the Hyde Square Shandy, which was quickly emerging as the hit of the night. 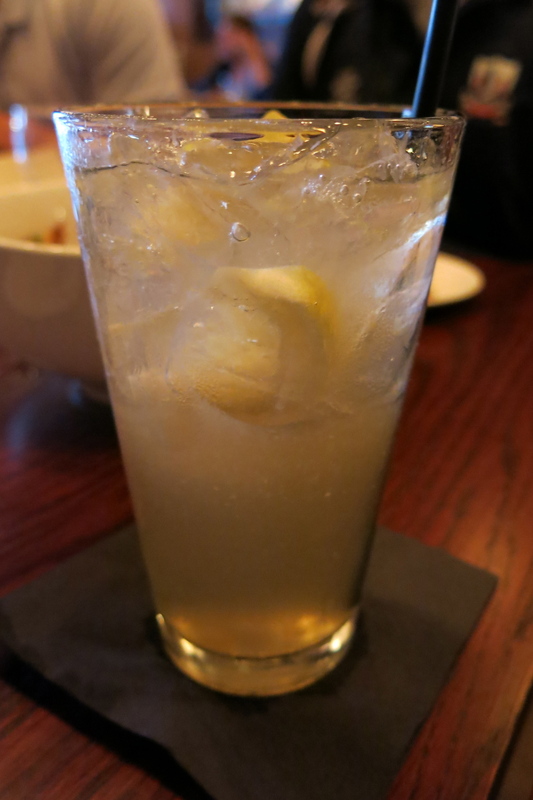 Danielle went with the Honey Pot Smash – honey tea bourbon, mint tea simple syrup, lemon juice, and soda water. She found it a little too sweet; no surprise, given her notoriously sour demeanor. I closed out with the Ward 10 Manhattan – rum, Punt E Mes, simple syrup, chocolate mole bitters, and cherry bitters (they seem uncommonly fond of cherry-infused drinks here). 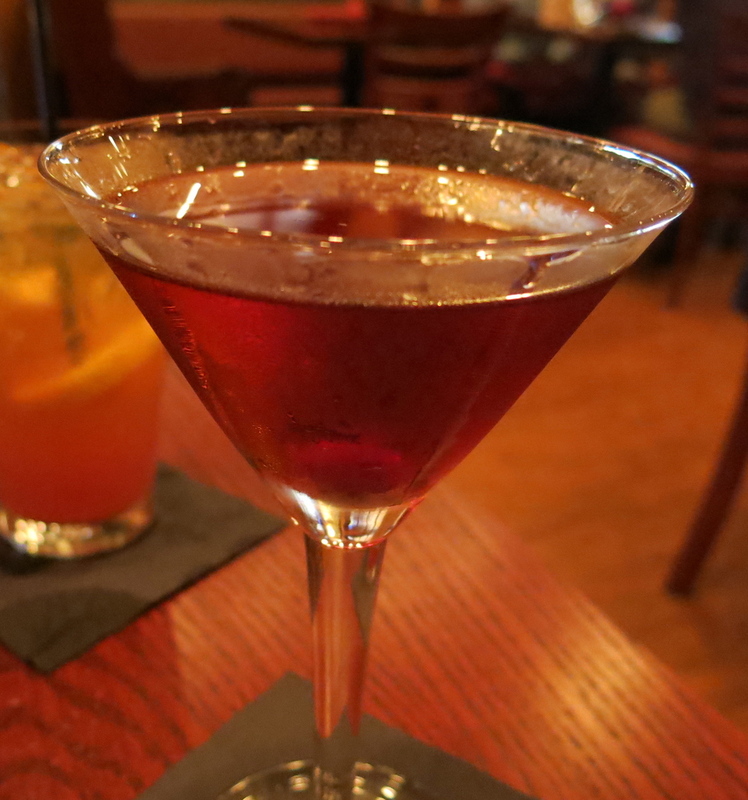 I’d always been curious about rum-based Manhattans, and this was intense and slow-sippin’. While nothing tops a traditional Manhattan for me, I liked this as a change of pace. The chocolate mole bitters worked especially well with the rich sweetness of the rum. When the check came, I almost expected it to show up on a collection plate. It might have been funny if it had, but one of the things I like about this place is that they don’t beat you over the head with the motif. The focus remains not on the décor but on the food and drink, as it should. I guess even an owner who’s willing to build his own bar out of a choir box knows when something is just good enough. He’s right. 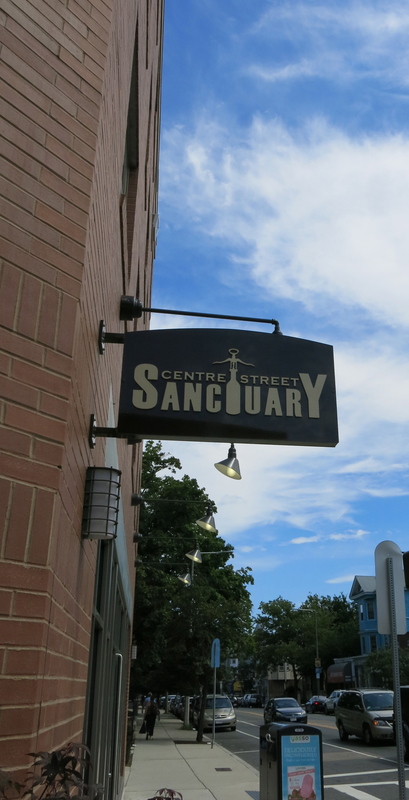 Centre Street Sanctuary feels right at home in JP – good service, good food, and good prices. And any bar with church pews for seating fulfills the quirk quotient. The drinks were pretty good, though none elicited a Hallelujah chorus. Some of them just had a little too much going on in them. But the Shandy was a favorite among the table, and my Ward 10 Manhattan was complex and intense. It’s too bad we didn’t avail ourselves of the beer selection, because it’s excellent. There are a dozen draft options, plus many more in bottles, cans, and even “22-Ounce Bombers.” It’s a broad, varied mix of local favorites and microbrews from around the country. Prices are definitely reasonable. Cocktails ranged from $8 to $10, which is pretty standard. The small plates averaged about $10, and the portions were fairly generous. The entrées were in the $12 to $13 range, which is also not bad. Oh, and the brunch menu looks fantastic. I don’t typically do brunch reviews (though that’s in the works), but there’s a slew of bloody marys and other tempting brunch cocktails. Uh, can I get an amen?